Michael's resource is the most comprehensive I have known and perhaps will never be surpassed. He covers around 100 sites in this area alone! The dive locations range from sponge and coral covered reefs to dramatic drop offs with underwater caves and swim throughs. 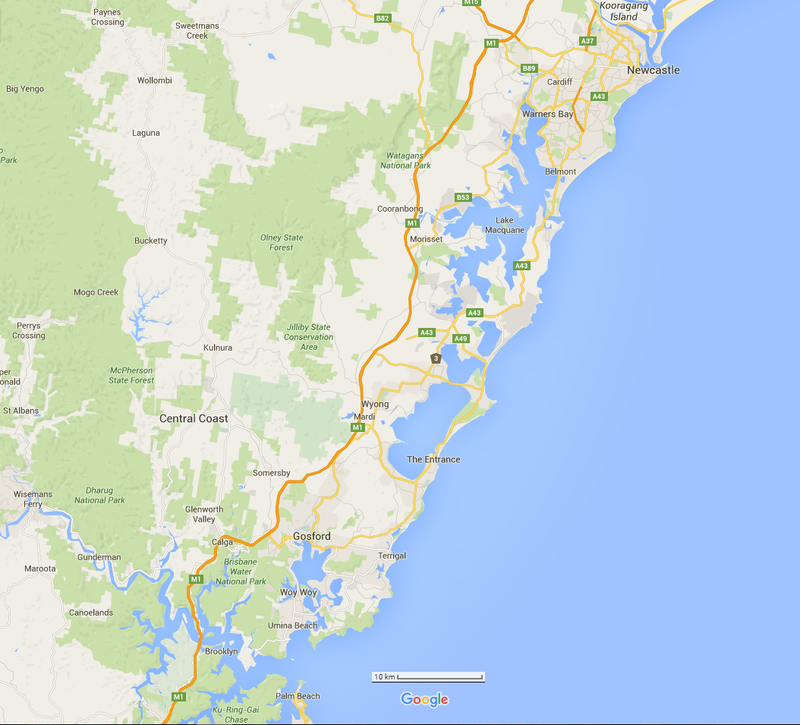 Many ships have foundered off the central coast and their skeletal remains can be found on the seabed. 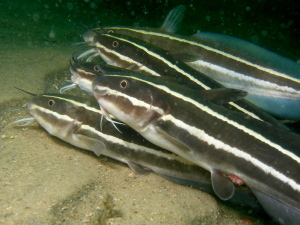 These then become artificial reefs and havens for great schools of fish. 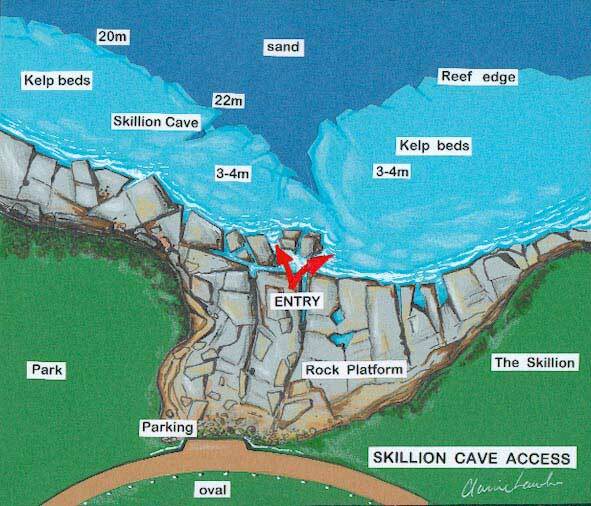 Below is a short list of some of our favourite dive sites of the central coast, with drawings of two of the most frequently dived, ‘Foggy Cave’ and the ‘Skillion Cave’ both boat dives but, if calm, the ‘Skillion Cave’, is a shore dive. 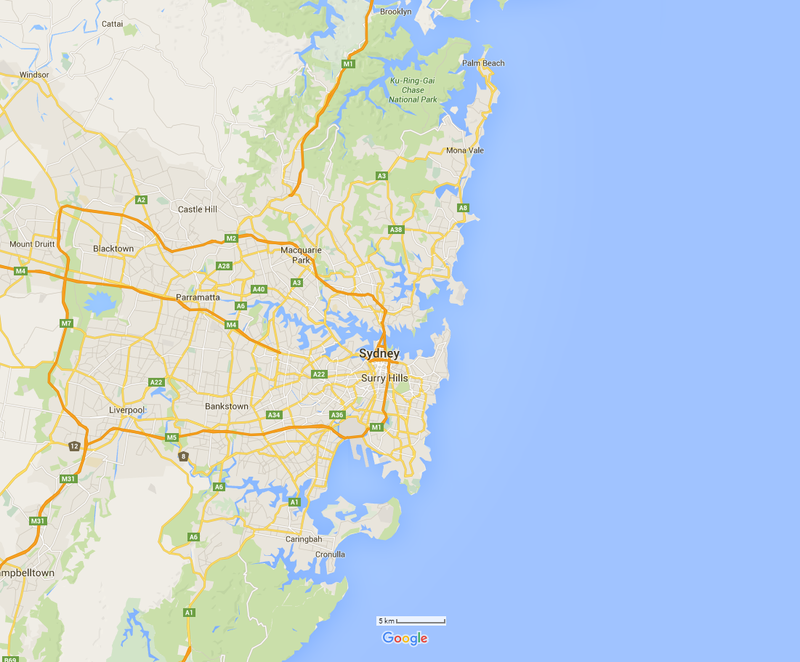 These are all shore dives accessible and just a short walk from Terrigal Dive Centre. 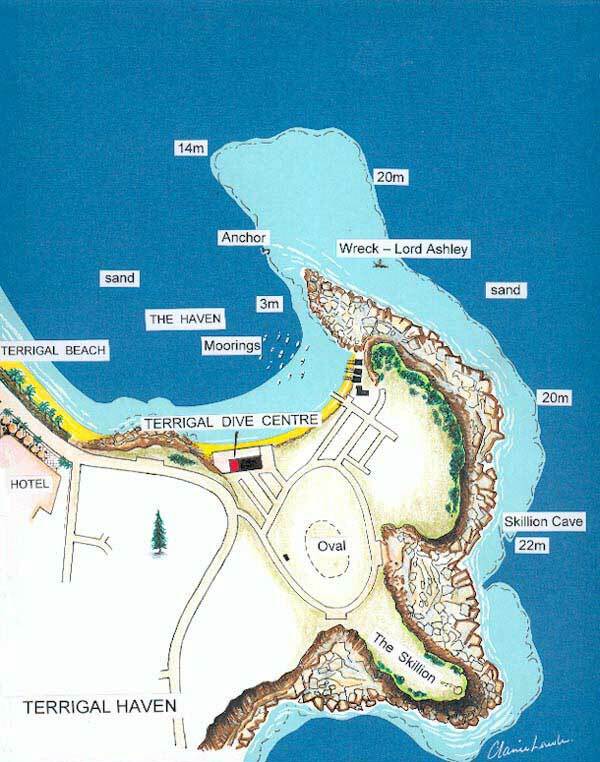 The ‘Haven’ in front of the Dive Centre is a beach entry. Out under the moored boats is a seagrass bed, hiding a multitude of small fish. Diving in this area you will sure to be accosted, if that’s the right word, by one or more of our giant black stingrays, some up to 2m across. Residents of the haven for many years, they are used to the divers and will swim alongside you. Further out along the rocky wall is a giant anchor, big blue gropers and schools of yellowtail. It is a very calm second dive of the day spot and is an absolute blast as a night dive where a 2m black stingray coming suddenly into your torch beam can really startle you. 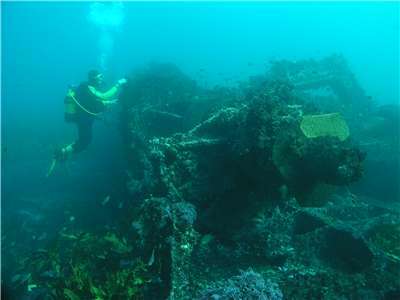 The remains of the Lord Ashley shipwreck, a 3 masted, sailing steam ship, sunk in 1877 can be seen in 7m of water just on the outside of the reef and sponge gardens can be explored by following the reef down to 18m. 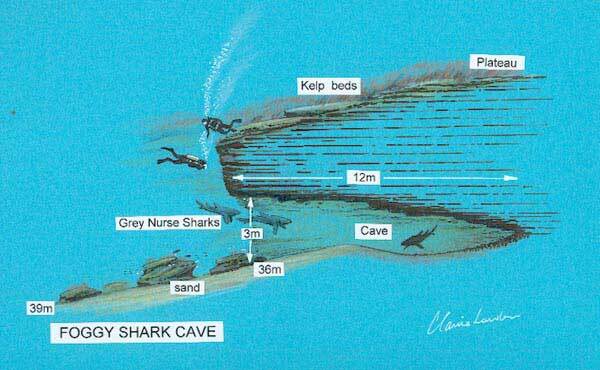 This is a well known dive site. It is a popular shore dive when the sea is calm but can be treacherous if there is a swell. Please feel free to come into the Dive Centre and ask if the conditions are safe on the day. 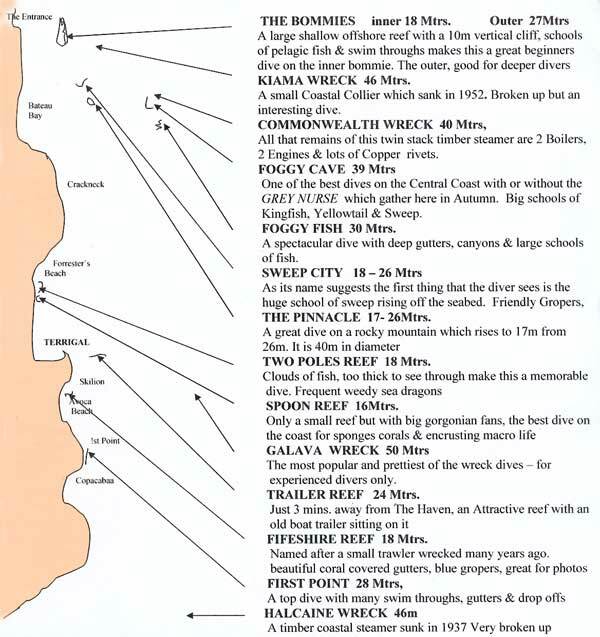 This dive site is also frequently dived as a boat dive, at least making for a safe entry and exit. 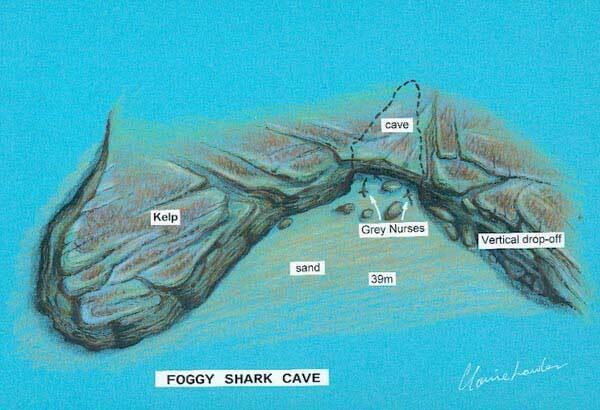 Again brilliant marine illustrator Clarrie Lawler has provided us with a map of the entry point and of the cave itself, something impossible to produce with a camera. To drop off the 12m cliffs that surround this cave is awesome in itself but once inside the cave, the walls are a kaleidoscope of colour from ascidian sponges and coral on the walls and at the right time of the day, the sunlight streaming in through the open roof gives a cathedral like quality. A pretty, shallow dive, with an underwater headland that attracts dense school of yellowtail and bulls eyes. Whilst out on the sand of the adjacent gutter you are sure to find Weedy Sea Dragons. Fifeshire Reef 14m-18m North Avoca. A series of fingers of reef with sandy gutters in between. The rocks and their walls are a host to sponges corals and ascidians one of the best locations on the coast for benthic marine life. Every dive centre seems to have a site called ‘The Pinnacle’, we are no exception. This curious rock formation comes up of the sea bed at 27m like a block of apartments. 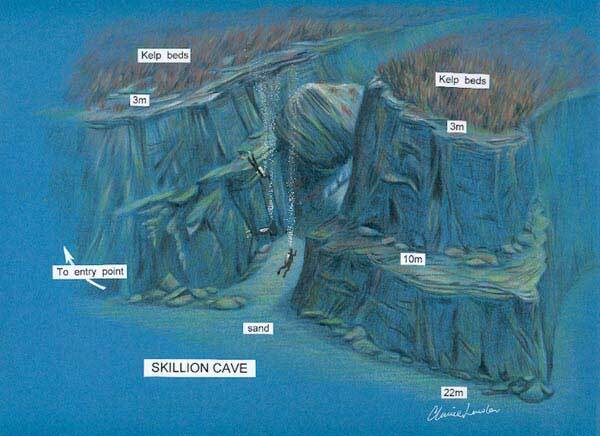 Only about 30m across at the base, the almost bald, dome like top is a mere 17m deep and 10m across. Big schools of fish hang around this structure. The prettiest of our local wrecks covered in yellow soft coral, well broken up since it sank in 1927. 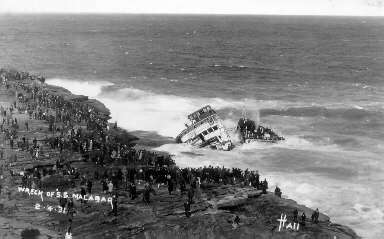 It is on sand but has a large boiler, lots of wreckage and attracts plenty of fish. Due to its depth, this dive is for the very experienced and well trained diver only, who is suitably equipped for this depth. 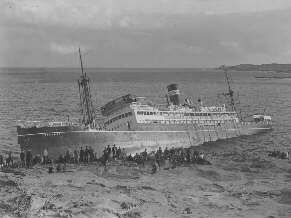 A small, coastal collier which sank in 1952. It is sitting on rock but well flattened. There is a large boiler, the engine can be seen lying on its side and the site is usually well endowed with big schools of fish. This too is a deep dive and should only be attempted by experienced divers with suitable training and equipment. 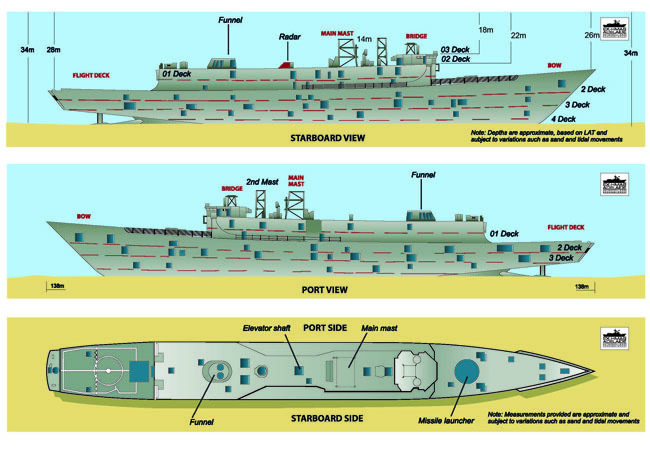 Named by Capt. Cook this series of ledges stepping down to 27m has lots of small swim throughs. In fact many are best described as squeeze throughs. Good marine life and lots of fish make this an easy beginners dive.